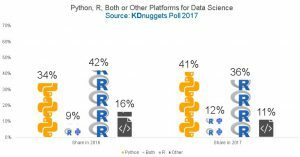 Anyone interested in Machine Learning often face this dilemma, which language to learn for Machine Learning: Python or R? If you already know at least one of this language, you are ahead of so many! I dont know either. As an economist I am well trained in Stata, SAS and Eviews; but not in Python or R. Many of us could be in same situation like me. By the way, SAS has a data miner app (SAS Enterprise Miner) that can be used for machine learning too. I am bit familiar with Matlab and it has very powerful and GUI machine learning app as well. Both of these software’s are very expensive, not viable for many students. I prefer to go with Python or R: they are free, open source, very strong and active community where you can get most of the problems solved very easily. But these are not as user friendly as SAS or Matlab. I will update a list of pros and cons for each here. Final verdict: If you want to learn only one language for machine learning, it is Python!